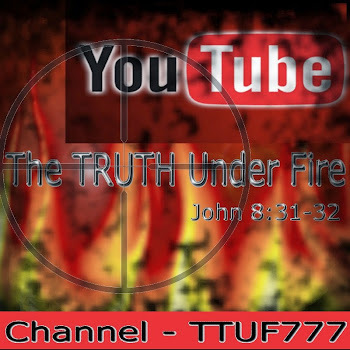 The TRUTH under FIRE: The HARBINGER – HOAX or HISTORY? At the outset, when I first considered the premise of The Harbinger, I wondered at this idea of ‘mystery signs’ given to warn America of judgment, because as we look around at our American landscape, it would seem rather obvious that our nation in on a one way collision with calamity because we are committing every atrocity that God hates as He specifically stated in His Word. Consider such rights and laws passed by our newly elected Federal administration and their purposes as an example of the things offensive to the LORD. God hates all sin because of His holiness and His love; His holiness because sin is high treason against the very HOLY KING of the creation and of all powers and authorities; of love because sin separates us sinners from partaking of His love for us as well as our ability in expressing our love for Him (Isaiah 59:1-3). Why would we need such a novel of mystery to tell us what should be blatantly obvious to any Bible-reading Christian? “There needs no ghost to come back from the grave to tell us this!” said Horatio. Once I read The Harbinger however, I was taken by the seemingly astounding events and remarkable ‘coincidences’ that surrounded the now infamous 9-11 and such occurrences that would seem to indicate that, like Israel of Ancient times, America is now under judgment. If one had no subsequent knowledge regarding the things that Cahn wrote about in his book, one would be hard pressed not to come to the same conclusions as he: that mystery signs have been given to America warning her of impending doom! Yet as I began reading the critique of this book by David James, he started to fill in missing details that shed new light on Cahn’s assertions regarding the truth of these matters. One of the reasons why people are sworn in with an oath during examination in court is because the truth needs to be known: “the truth, the whole truth and nothing but the truth”. It’s possible to tell the truth mixed with lies, and the entire matter because of this mixture may seem plausible. 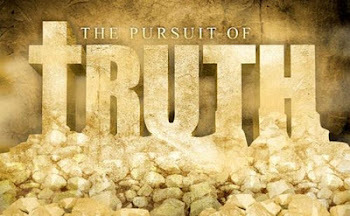 Likewise, one can tell the absolute truth, but omit other parts of the truth and this will alter the perception of the hearers. 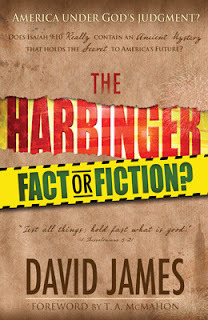 Cahn tells the truth in his book, but not all, and that affects the perceptions of those that read The Harbinger. It is my hope that at the conclusion of this three part article our readers will, at the very least show caution in expressing their support of this novel or at best, understand the fallacies that Cahn builds upon in his work. While others have already presented their own views on this book like Apprising Ministries and The Berean Call (among others); having read both I shall now tackle a treatment of my own regarding this story and the supposed facts of the matter as reported by Jonathan Cahn. So let us begin our examination . . .
“One serious departure from using a biblical hermeneutic is [Cahn’s] failure to mention the preceding verses in the chapter. These verses form a critical part of the immediate context of Isaiah 9: 10 and represent one of the most important messianic kingdom passages in the entire Old Testament. Biblical hermeneutics has to deal with how to interpret the Bible and there are generally two methods; the one is a very liberal, allegorical method which assumes the weight of interpretation on the subjective perceptions of the interpreter. The second method is a very conservative, literal, grammatical, historical approach which relies on the objective observance to what the text literally says in its original language and its historical context. Isaiah 9:10 refers specifically to the northern kingdom of Israel in the eighth century B.C. and not to any other nation at any other time (Even J. Cahn agreed with this in a moderated discussion with David James on the radio program Prophecy Today), including America. Yet even though Cahn agreed with this assertion on the program, the book nevertheless intimates that this passage has in some mysterious way, a connection to America and forebodes of judgment. Cahn further stated that Isaiah 9: 10-11 reflects a pattern (or “template”) of God’s judgment and uses nine theoretical harbingers which purportedly coincide with recent historical events, beginning with the terrorist attacks on Sept. 11th 2001. The idea of a biblical “template for God’s judgment” exists no where in all of Scripture; it is a theoretical idea of Cahn’s alone. Isaiah gives no indication by the Spirit of the LORD that this is such a template, nor does this theory have precedent or repeated use of such a template. A straightforward reading of Isaiah chapter 9 would not elicit such an idea. What mystery revelation can be revealed from Isaiah 9: 10 that can’t be understood from the plain reading of the text? And if it cannot be revealed by simply reading the Scripture, such understanding must come from an outside source, namely the interpretive exposition of Jonathan Cahn (or commentaries that are referred to in the novel as having revelatory value), which is a form of eisegesis or “reading a meaning into the text, independent of the text itself”. Could the revelation of this mystery be imparted to Mr. Cahn by God? Would not this then mean that Mr. Cahn holds the office of a prophet? This is something that he would neither affirm nor deny when asked by inquirers. The author of The Harbinger appears to make the assertion that the prophecy of Isaiah 9: 10 was delivered to Israel specifically, but that it’s not necessarily delivered exclusively to Israel, but this assertion he has attempted to clarify by saying that while it’s a prophecy for Israel, the passage is more of a ‘sign’ to America. 30 And then shall appear the sign of the Son of man in heaven: and then shall all the tribes of the earth mourn, and they shall see the Son of man coming in the clouds of heaven with power and great glory (See also Matt. 12: 36-41; 16: 2-4; Acts 2: 22; Heb. 2: 4). Any sign given by God in the Scriptures dealt with judgment, and all such signs are always associated with prophecy. So for Mr. Cahn to state that Isaiah 9:10 was a prophecy to Israel, but only a sign to America cannot make his case because you can’t have a sign (given to any nation) without a prophecy with which its associated and such a prophecy that deals particularly with judgment. If these harbingers are each “carrying a revelation” then these harbingers are not only signs, but prophecies, and once the prophecy is fulfilled that would be a sign that it was truly a prophecy from God. To maintain that this was a prophecy to ancient Israel, but only signs to America then is meaningless as well as misleading. Another point must be made: in any and all cases when the LORD God is pronouncing judgment, either upon Israel or any Gentile nation, such prophecy that would warn of the impending judgment was not only clear, but entirely clear so as to avoid any misunderstandings. Never in all the pages of Scripture did the LORD pronounce judgment, but couched in mysterious riddles or coincidental events that must be uncovered and related by someone with gifted insight that would then make such pronounced judgments clear to a people. All too often Israel ignored or even rejected the word of the LORD from the prophets, but the message was nevertheless quite clear; and in Jonah’s case, the word was clearly understood by the brutal and war-like Assyrians and they responded with repentance! If in fact therefore The Harbinger speaks of impending judgment on America, it would be a prophetic word, and the LORD God has never in all the pages of Scripture brought a prophet to Israel or any other nation with a message couched in obscure and 'hidden' meaning. Examination of the prophets words (such as the quotes above) reveals the truth of this. This concludes part one of this message, and part two and three will be forthcoming. Until then, may the LORD continually bless you saints - WAY TOO MUCH! post. They're very convincing and will definitely work. Still, the posts are too short for newbies. After going over a number of the blog articles on your web site, I really appreciate your way of writing a blog.